There are about 90 species of the bromeliad Neoregelia that grows wild in the rainforests of South America. Beyond that, there are hundreds of hybrids, with an amazing variety of size, form, and color. Neoregelias range from the very large, almost statuesque bromeliads, to the squat and colorful landscape plants seen throughout the tropics. Indoors, the most common Neoregelia species don't have the towering flower bracts of other bromeliads—their flowers stay closer to the central cup, and the newer leaves flush different colors. Nevertheless, these are beautiful plants in their own right. These plants are safe to grow outside in U.S. Department of Agriculture plant hardiness zones 9 and 10 but must be kept indoors as houseplants during cooler months in the rest of the zones in the United States. Follow these guidelines for striking additions to your houseplant collection. Light: These plants thrive in Indirect light or moderate shade. They can be acclimated to higher light levels. Water: Keep water in the central cup. Change the water frequently with clean water to prevent odor and bacteria. Temperature: These plants are somewhat more cold hardy than many tropicals, but they prefer 55 F or higher. They can survive to 40 F if you have taken them outside for the summer and there's a cold dip in nighttime temperatures, but it's not advised. Soil: Use any soil mix. These are technically air plants that use their roots for support. Fertilizer: Fertilize very sparingly with a liquid fertilizer in the central cup during growing season. 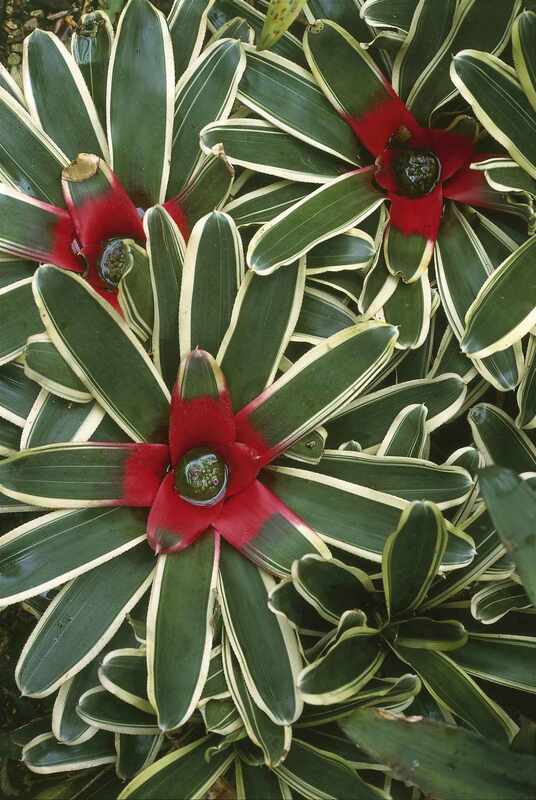 Neoregelia, like all bromeliads, spreads by producing offsets or plantlets around the base of mature plants. After the mature plant has flowered, the mother plant will gradually die back as the pups take over. These can be potted into their own pots. Mature bromeliads should not be repotted. Smaller bromeliads can be potted into small containers until they are established, then moved into 4- or 6-inch pots until they flower. Neoregelias are somewhat lower, broader plants than some of the other bromeliads (like Guzmania and Aechmea), so they are less likely to topple over in their new pots. By far the most common Neoregelia species seen in garden centers is the Neoregelia carolinae, which grows in larger rosettes of strappy, narrow leaves, often with beautiful variegation. As the plant flowers, the center of the cup blushes red, and small flowers emerge. Mature plants are usually less than a foot in height and spread up to 20 inches. Many other Neoregelia species are available, but these are considerably less common and harder to find. Neoregelia plants are not difficult bromeliads to grow, but they are somewhat more dependent on strong light to develop deep, vivid colors in their leaves than others. They can even withstand some gentle direct sunlight, such as eastern morning exposure. As with other bromeliads, avoid tap water in the central cup if possible and don't overfeed them. Provide ample humidity during the summer growing season by misting.